Wilke develops, designs, and manufactures high precision, complex extrusion dies for the aluminium industry. The company was founded in 1963 in Wuppertal and is now part of Phoenix International S.p.A. in Verdello (Italy), one of the world’s leading business groups. With cutting edge machinery and decades of experience, Wilke is a strong partner for companies throughout Europe. With Wilke, extrusion companies have a partner to whom they can entrust their key production component: the production of extrusion dies. Together with Wilke, they can achieve optimum production results with minimum use of resources. Customers include both leading aluminium groups as well as SME extrusion plants. Wilke designers and development technicians are qualified specialists with many years of experience. They know all the details critical to the design and production of extrusion dies. 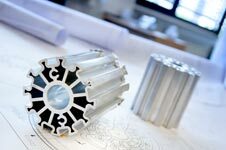 This outstanding expert knowledge makes Wilke a leading technological development partner for sophisticated extrusion dies.